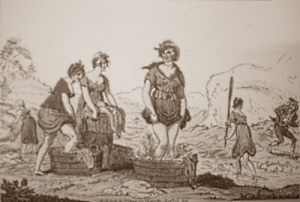 Chinese washerwomen pound their clothes with stones, as is done on the Continent in Europe, a method more suited to the stout cottons they wear themselves than to the delicate fabrics of Western Europe. Once upon a time a metal washboard and bar of hard soap with a tub of hot water was a new-fangled way of tackling laundry, though today it's a common picture of "old-fashioned" laundering. (Read about this on a page about the later history of laundry in the 1800s.) What went before? How did people wash clothes without the factory-made equipment and cleansing products of the 19th century? 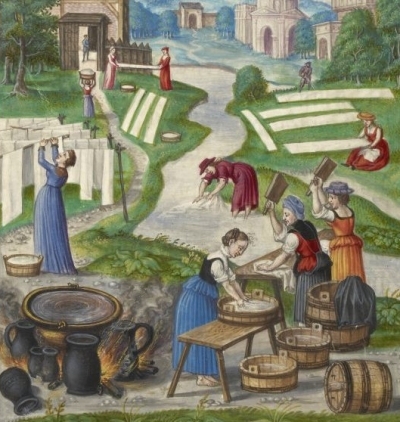 This page is an introduction to the history of washing and drying household linen and clothing over several centuries: from medieval times up until the 19th century. It concerns Europe, North America, and the English-speaking world more than anywhere else. It's not only an overview; it's also a guide to the other laundry history pages on this website. The links take you to more detailed information and more pictures. Along the way you'll find answers to questions that OldandInteresting gets asked a lot - like, "Is it true people used to wash their clothes in urine?". Domestic laundry was often treated like newly woven textiles being "finished". Today we have only vague ideas about how the fabrics in our shop-bought clothes are manufactured, but traditional laundry methods often followed techniques used by weavers, including home weavers. 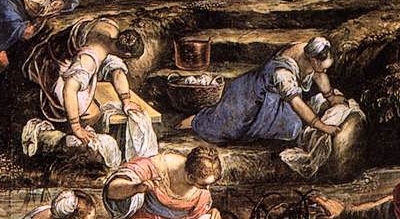 Soaking laundry in lye, cold or hot, was an important way of tackling white and off-white cloth. It was called bucking, and aimed to whiten as well as cleanse. Coloured fabrics were less usual than today, especially for basic items like sheets and shirts. 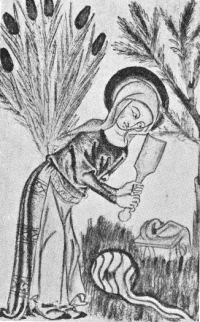 Ashes and urine were the most important substances for mixing a good "lye". As well as helping to remove stains and encourage a white colour, these act as good de-greasing agents. Bucking involved lengthy soaking and was not a weekly wash. Until the idea of a once-a-week wash developed, people tended to have a big laundry session at intervals of several weeks or even months. Many women had agricultural and food preparation duties that would make it impossible for them to "waste" time on hours of laundry work every week. If you were rich you had lots of household linen, shirts, underclothing etc. and stored up the dirty stuff for future washing. If you were poor your things just didn't get washed very often. Fine clothing, lace collars and so on were laundered separately. At London, and in all other Parts of the Country where they do not burn Wood, they do not make Lye. All their Linnen, coarse and fine, is wash'd with Soap. When you are in a Place where the Linnen can be rinc'd in any large Water, the Stink of the black Soap is almost all clear'd away. The Grand Wash or the Great Wash were names for the irregular "spring cleaning" of laundry. Soaking in lye and bucking in large wooden bucking tubs were similar to processes used in textile manufacturing. So was the next stage - drying and bleaching clothes and fabrics out of doors. Sunshine helped bleach off-white cloth while drying it. Sometimes cloth was sprinkled at intervals with water and/or a dash of lye to lengthen the process and enhance bleaching. 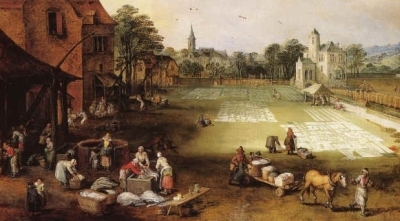 Towns, mansions, and textile weavers had an area of mown grass set aside as a bleaching ground, or drying green, where household linens and clothing could be spread on grass in the daylight. Early settlers in America established communal bleaching areas like those in European towns and villages. 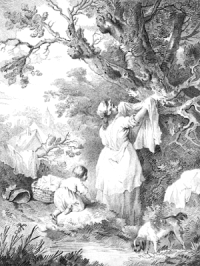 Both washing and drying were often public and/or group activities. In warmer parts of Europe some cities provided communal laundry spaces with a water supply. People also dried clothes by spreading them on bushes. Large houses sometimes had wooden frames or ropes for drying indoors in poor weather. 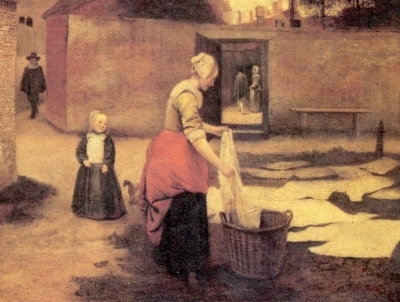 Outdoor drying frames and clotheslines are seen in paintings from the 16th century, but most people would have been used to seeing laundry spread to dry on grass, hedgerows etc. Clothes pegs/pins seem to have been rare before the 18th century. Pictures show sheets etc. hung over clotheslines with no pegs. If you want to know about one particular time and place, you may need to do more detailed research, but we hope you will find plenty of information on this site to get you started.